Piano Trios - Bohuslav Martinů - Mediální ohlasy - ArcoDiva management - Hudební agentura - Hudební agentura ARCO DIVA Management s.r.o. Marvellous programming here. 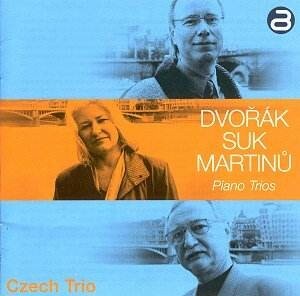 The Czech Trio plays three native works with the utmost dedication in a spacious, supporting recording. The Dvořák is a magnificent piece, and the Czech Trio serve it splendidly. There is a nice sense of Romantic sweep to the first movement. The piano sound is well-rounded, the violin sweet of tone. Most importantly the rhythmic impulse is there, so vital tosuccessful Dvořák performance. It prevents interpretative ‘spreading’ or sprawling. Miroslav Patráš’s cello sings well, although it is caught just a little edgily. If the whole could be more ecstatic at times, the scherzo-like Allegretto grazioso works so well because there is a slight weight underpinning it that is entirely appropriate to the music. Long violin lines give off the requisite sense of yearning. But the highlight of this reading is the Poco adagio, a gorgeous unfolding, unhurried yet not indulgent. A shame, then, that the ‘con brio’ marking of the Finale is not really adhered to. The more reflective passages work well, but could benefit from further highlighting by even more immersion intoDvořák’s more spirited side elsewhere in the movement.